We know the winners at the Junior Grand-prix in Barcelona but who will will the fashion medals? See my trandy ranking. I like the modern concept of costumes and have no question about male set. But her dress doesn’t suit her body type and makes it visually bigger. Black tights only emphasise the impression of heaviness. I don’t think it’s so necessary to change costumes on this stage of the season but at least she can wear light tights. Again I have no question about Michael’s costume. It’s classical ballroom set for latina dances. It’s suits him, highlights the lines and totally in style of the program. Rachel’s dress spoils the whole impression. It looks cheap. And the skirt is too short from one side what doesn’t look nice during elements. Lorraine definitely used as prototype for her dress a classical ballet Carmen’s dress. It looks good on her, I also like the fringe on top of the lace skirt. It would have been a nice (not so interesting but nice) Carmen’s dress, but those gloves…..( The gloves look cheap. I also like that they didn’t make a creative costume for Quinn, It would have been too much. This set vinous shirt and black pants is a pretty wise decision. After their costumes for the short dance I was quite surprised (in a good way) with their costumes for the free dance. Classical ballroom latina. Multi Layered skirt look great in motion, the cuts on the sides make her waist look even thinner. Not lots of decoration. 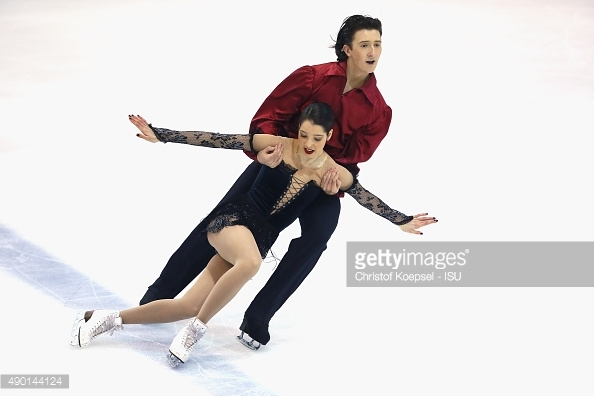 I think skaters should remember Anastasia’s dress and use the idea in latina’s short dance season. I like this minimalist black costumes. Simple, modern, hot, totally suitable for their free dance. Costumes have a real clothes look and it’s quite a trend in figure skating fashion. I really don’t want to add something or remove something. They have polished the free dance and now the idea looks more clear, especially Pavel’s character. So, now I don’t want to make his costume more formal. No, it represents the inner passions of the character he plays. I like All A’s dress a lot. It’s so beautiful! Nice combination of soft pink and white tender laces. Romantic silhouette looks perfectly for this program. I really like such choice for the junior lady.